Resting in the south east coroner of Texas’ panhandle is the incorporated community of Dawn, a century-old township in the middle of America’s heartland. Forty-year-old, single-family homes fill the streets along State Highway Sixty in this Amarillo suburb; farmland and small ranches surround the community’s northern and southern regions. Average temperatures range from twenty-five degrees Fahrenheit in the winter to ninety degrees during the summer, with light snow falling on the North Texas town from December to March. 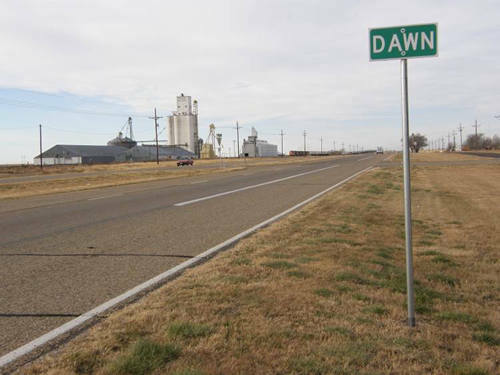 Dawn has a population of just over one hundred people who either work in the nearby cities of Amarillo and Canyon; or farm the land surrounding the town; or work in shops and restaurants that serve travelers who stop by the city while driving along Highway Sixty. Because Dawn is such a small community, its low supply of listings in the market shielded properties from the housing crisis that affected the rest of the nation. Single-family, two to three-bedroom homes range from $50k to $123K, depending upon the location of the land with the most expensive properties found near the highway. On the contrary, farms, lots and small ranches realized a recent upswing in market value, where ten acres of farmland in 2013 listed at just over $40k. Most rural areas in Dawn have water tower access and electricity, but a few distant properties lack these amenities, requiring investors to seek other energy generation and water means. Since Dawn is an incorporated community, many businesses prefer to open-up shop eighteen miles north, in the town of Canyon. This is where most people can find their nearest real estate appraisers who can assess both farmlands and home market values. Most appraisal companies do not charge mileage fees, and a good number of firms offer short turn-around times; on-line status reports; and electronic ordering and delivery, when providing services. Dawn was the second city in Texas to receive a fully-operational United States Post Office; today, the building is a historical landmark still and delivers mail to city residents. A few diners and filling-stations also operate in Dawn, but most residents prefer to spend their leisure time visiting the community’s surrounding cities. Canyon hosts year-round West Texas A&M sporting events and is also home to the Panhandle-Plains Historical Museum. The nearby Palo Duro Canyon State Park and Buffalo Lake National Wildlife Refuge offer Dawn’s residents some outdoor sports opportunities, including wildlife viewing, picnicking, camping, photography hiking and hunting. Dawn Cafe - Heartland American food made for residents and weary travlers. Jim Moore’s Ranch - Dawn’s first ranch house and general store. Smokey Mayfield and Thomas Edd Mayfield Memorial - Home of famous American Bluegrass musicians.